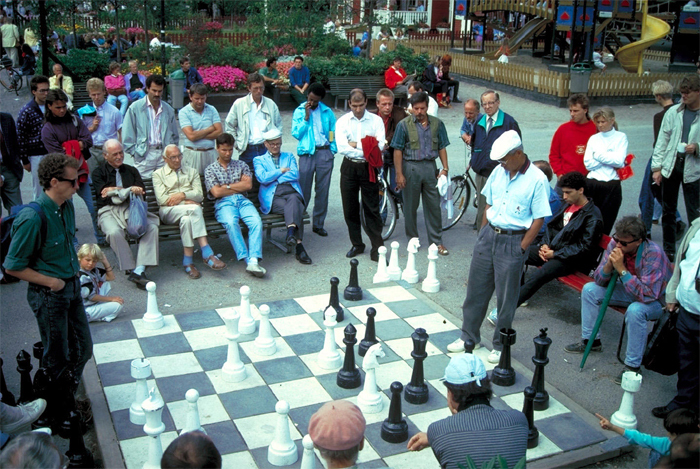 Great public spaces are those places where celebrations are held, social and economic exchanges occur, friends run into each other, and cultures mix. They are the “front porches” of our public institutions – libraries, field houses, schools – where we interact with each other and government. When theses spaces work well, they serve as the stage for our public lives. 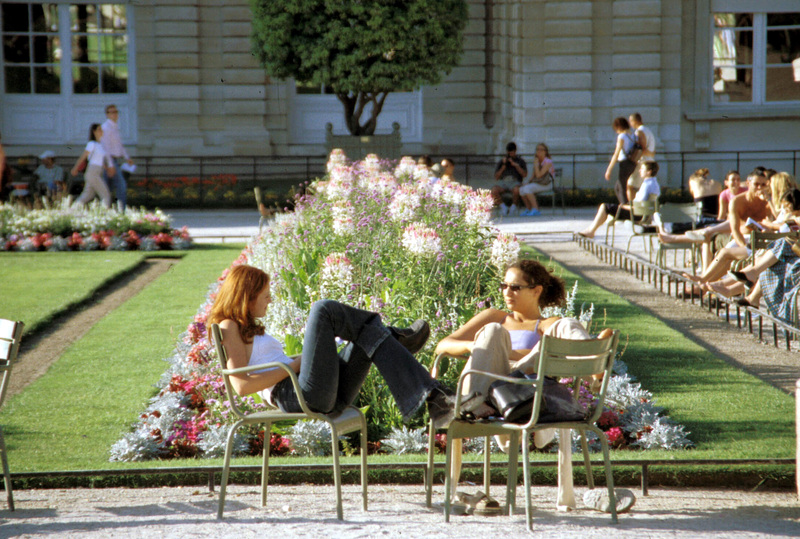 In evaluating thousands of public spaces around the world, PPS has found that to be successful, they generally share the following four qualities: they are accessible; people are engaged in activities there; the space is comfortable and has a good image; and finally, it is a sociable place: one where people meet each other and take people when they come to visit. 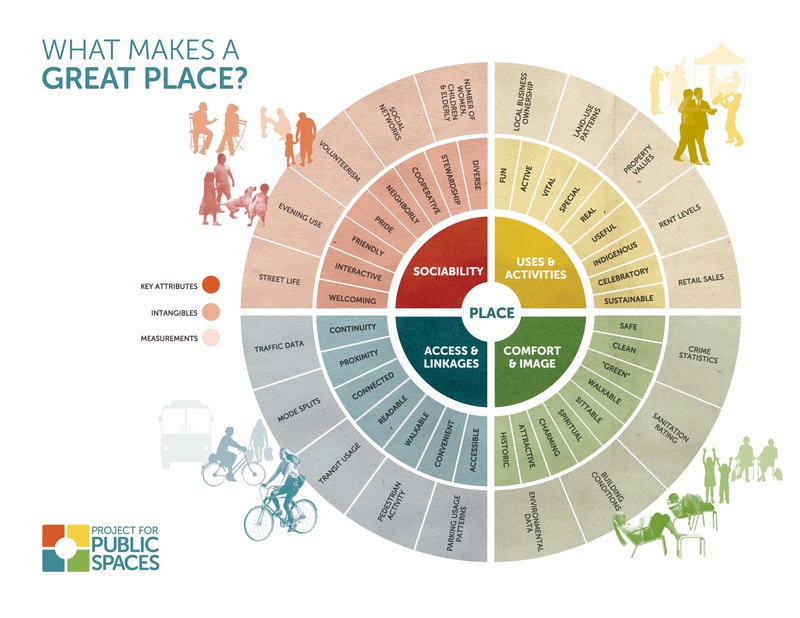 PPS developed The Place Diagram below as a tool to help people in judging any place, good or bad. You can judge the accessibility of a place by its connections to its surroundings, both visual and physical. A successful public space is easy to get to and get through; it is visible both from a distance and up close. The edges of a space are important as well: For instance, a row of shops along a street is more interesting and generally safer to walk by than a blank wall or empty lot. 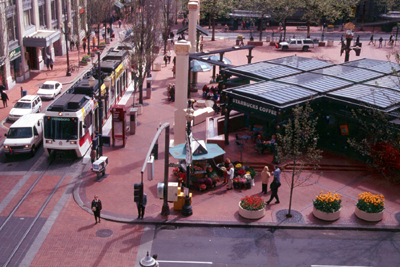 Accessible spaces have a high parking turnover and, ideally, are convenient to public transit. Can you see the space from a distance? Is its interior visible from the outside? Is there a good connection between the space and the adjacent buildings, or is it surrounded by blank walls? Do occupants of adjacent buildings use the space? Can people easily walk to the place? For example, do they have to dart between moving cars to get to the place? Do sidewalks lead to and from the adjacent areas? Does the space function for people with special needs? Do the roads and paths through the space take people where they actually want to go? Can people use a variety of transportation options - bus train, car, bicycle, etc. - to reach the place? Are transit stops conveniently located next to destinations such as libraries, post offices, park entrances, etc.? Whether a space is comfortable and presents itself well - has a good image - is key to its success. Comfort includes perceptions about safety, cleanliness, and the availability of places to sit - the importance of giving people the choice to sit where they want is generally underestimated. Does the place make a good first impression? Are there more women than men? Are there enough places to sit? Are seats conveniently located? 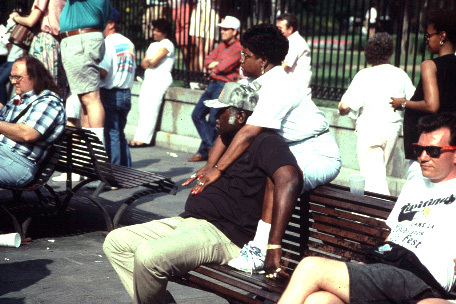 Do people have is a choice of places to sit, either in the sun or shade? Are spaces are clean and free of litter? Who is responsible for maintenance? What do they do? When? Does the area feel safe? Is there a security presence? If so, what do these people do? When are they on duty? Are people taking pictures? Are there many photo opportunities available? Do vehicles dominate pedestrian use of the space, or prevent them from easily getting to the space? Activities are the basic building blocks of great places: They are the reasons why people visit in the first place, and why they continue to return. They are also what makes a place special or unique. When there is nothing to do in a place, it will sit empty and unused—a sure sign something needs to change. The more activities that are going and that people have an opportunity to participate in, the better. There is a good balance between men and women. People of different ages are using the space (retired people and people with young children can use a space during the day when others are working). The space is used throughout the day. A space that is used by both singles and people in groups is better than one that is just used by people alone because it means that there are places for people to sit with friends, there is more socializing, and it is more fun. The ultimate determinant of a place's success is how well it is managed. Are people using the space or is it empty? Is it used by people of different ages? How many different types of activities are occurring - people walking, eating, playing baseball, chess, relaxing, reading? Which parts of the space are used and which are not? Are there choices of things to do? Is there a management presence, or can you identify anyone is in charge of the space? This is a difficult quality for a place to achieve, but once attained it becomes an unmistakable feature. When people see friends, meet and greet their neighbors, and feel comfortable interacting with strangers, they tend to feel a stronger sense of place or attachment to their community - and to the place that fosters these types of social activities. Is this a place where you would choose to meet your friends? Are others meeting friends here or running into them? Are people in groups? Are they talking with one another? Do people seem to know each other by face or by name? Do people bring their friends and relatives to see the place or do they point to one of its features with pride? Are people smiling? Do people make eye contact with each other? Do people use the place regularly and by choice? Does a mix of ages and ethnic groups that generally reflect the community at large? Do people tend to pick up litter when they see it?